To start this show, we chat about Animal Voices’ successful Animal Liberation Talent Show that we held last week! Local animal activists came out to showcase their talents with a variety of music and poetry to spread the message of speaking up and fighting for the animals. Hope Bohanec, The Ultimate Betrayal: Is There Happy Meat? Our feature interview is with animal activist Hope Bohanec. Hope has been active in animal protection and environmental activism for over 20 years and is a nationally recognized leader and speaker in the animal protection movement. Many years ago while living eighty feet off the ground in a redwood tree so it would not be cut, Hope dedicated herself to animal and environmental causes, and has since organized countless public education campaigns, demonstrations, and fundraisers to offer a voice for animals. 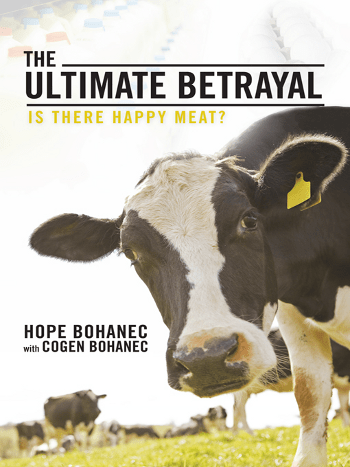 Hope is currently the Projects Manager for United Poultry Concerns, but in addition to that, she has co-authored a book with Cogen Bohanec entitled “The Ultimate Betrayal: Is There Happy Meat?”, and in this interview we discuss that exact question. She enlightens us on the details involved with the process of producing what is often called “happy” or “humane meat” – that is, raising animals with so-called humane standards as opposed to their factory farmed counterparts. Topics we speak about include the growing trend towards consumer awareness for their meat products; industry standards and practises in food labeling for “humane” products; how organic meat, dairy and egg products are actually worse for the animals than conventional factory farm standards; and the standard animal raising and slaughtering practises that are the same in the “humane” industry as for conventionally-raised animals.